Jorhat was agog with hectic activities on Thursday with bigwigs of the Krishak Mukti Sangram samiti (KMSS), All Assam Students’ Union (AASU), Asom Jatiyatabadi Yuva Chatra Parishad (AJYCP) and the Congress planning and taking out rallies to oppose the Citizenship (Amendment) Bill, 2016. The KMSS and AJYCP, which have joined hands, will take out a huge march – ‘Raj Bhawanloi Baulak’ – to Raj Bhawan in Guwahati on June 12. They will submit more than 10000 memoranda to the Joint Parliamentary Committee (JPC) on the Bill through the Governor demanding withdrawal of the Citizenship (Amendment) Bill, 2016. On the other hand, former three-time Assam Chief Minister Tarun Gogoi, former cabinet minister Rakibul Hussain, AICC secretary and former Jorhat MLA Rana Goswami, former Kaliabor MP Dip Gogoi and Mariani MLA Rupjyoti Kurmi participated in a rally taken out by the Jorhat district unit of the party to oppose the Bill. The Congress leaders in their addresses lambasted the poor performance of the State government “which had failed in all fronts”. The protestors later submitted a memorandum in this regard to the Jorhat district administration to be forwarded to the JPC. 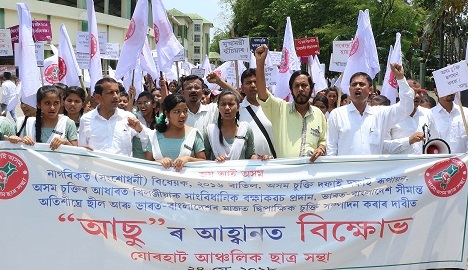 The Jorhat regional unit of the AASU also took out a huge a rally here on Thursday opposing the Bill. The rally started from the Jorhat Stadium. 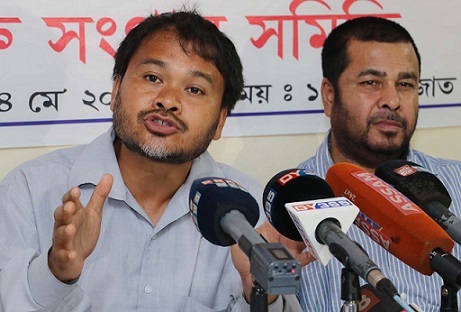 AJYCP leader Putul Dutta, KMSS advisor Akhil Gogoi while addressing the media in a meeting here on Thursday said that both the organizations had joined hands to unite all students’ groups irrespective of religion or political affiliation in order to intensify their stir against the Bill. The leaders said that copies of the memorandum would be sent to the President, Prime Minister and the Lok Sabha Speaker. Gogoi said that in order to intensify their stir , both the KMSS and the AJYCP had approached leading students’ organizations of various communities and were planning mammoth protest rallies jointly across the State to strengthen the fight against the Bill, which is posing a grave threat to the existence of the Assamese society. Gogoi said the proposed march on June 12 would have people from various organizations (students, social and others) of different communities from the villages and towns and memoranda in this regard had been sought from SHGs, clubs, different bodies and associations from business communities and also from places of worships of different faiths and linguistic communities. The leaders appealed to all naamghars, masjids, churches, guruduwaras and other religious institutions to come forward to contribute in the movement to protect Assamese identity and existence. Gogoi, while stating that the proposed programme will be organized in a “peaceful and democratic way”, urged all concerned to prepare memorandum to oppose the Bill and offered assistance to prepare the memoranda. He provided three e-mail ids where organizations could mail their draft of the memoranda for necessary corrections and submission. The email ids are: polash.changmai123@gmail.com, secretarykmss@gmail.com and saikiabhasco@gmail.com. Gogoi blasting the vote bank politics being played by the BJP and its allies said that the Centre’s decision to enact a law by passing the Bill which would grant citizenship to Hindu illegal migrants from the neighbouring country on the basis of religion was part of the strategy to get votes across India during 2019 Lok Sabha polls in the name of Hindu religion. The KMSS leader also said the Bill does not have any cut-off date for granting citizenship to the illegal migrants which meant that the Bill, if passed, will be like offering of a blank cheque to Hindu Bangladeshis. He claimed that 1.7 crore Hindus were presently residing in Bangladesh as per figure made available by the Bangladesh Bureau of Statistics. Gogoi added that another issue of BJP-RSS combine was the issue of Ram Mandir construction, which along with after passing the Bill was aimed to polarize the voters on communal lines. He further cautioned, even if the Bill is not passed by the Government in the Parliament due to protests, the threat hung over the Assamese society would remain as three executive orders passed by the Centre since September 7, 2015 had granted amenities and facilities to the Hindu illegal migrants from Bangladesh, who entered India till December 31 2014, barring voting rights and the right to contest elections. Gogoi also slammed the AGP, a partner in the Sarbananda Sonowal-led government for not raising their voice despite most of them being former AASU leaders and spearheading a six-year Assam Agitation to oust illegal migrants from Assam. Terming AGP’s protest a lip service, Gogoi said the party leaders were only limited to issuing statements without following up with action. He dared the AGP to raise opposition to the Bill in the next cabinet meeting and get a decision opposing the Bill passed by the Assam cabinet like what the Meghalaya cabinet had done recently. Gogoi also asked Jorhat’s AGP MLA and the Speaker of the State Assembly, Hitendra Nath Goswami, a former AASU, to convene a special session of the State Assembly and to have a discussion on the issue.